Applications to Waldegrave Sixth Form for September 2019 are now closed and unfortuntely we are unable to accept late applications. See below for more information on the application process. Applications for entry for September 2020 will go live in October. More information about how to apply will be provided nearer the time. We will be holidng an Induction Day for prospective Year 12 students on Wednesday 26 June. Further details about the day and how to book will be posted online in due course. Students wishing to apply for September 2019 apply online through UCAS Progress from Monday 1 October 2018. Deadline for applications is 23:59hrs on Friday 11 January 2019. We cannot accept late applications. For a step by step guide and useful videos on how to apply please follow this link. Please be aware that we will contact your school for a reference prior to the interview. ALL COMMUNICATIONS ARE SENT VIA UCAS PROGRESS TO THE APPLICANT'S MAIN EMAIL ADDRESS SUPPLIED IN THE APPLICATION. Applicants must check their emails regularly (including their SPAM boxes). We would advise using an address which is monitored regularly which could be a parent’s. Failure to respond to communications will result in applications being marked 'unsuccessful'. Applicants who have an EHCP or SEND plan MUST apply via UCAS Progress and should send copies to Mrs Page, Director of Sixth Form by Friday 11 January 2019. Please email your plan to sixthform@waldegrave.org.uk or post to Waldegrave School Sixth Form, Fifth Cross Road, Twickenham TW2 5LH. External applicants: If your school has not registered you on UCAS Progress you can self-register by clicking on the link below. If your school does not come up on the list then go to ‘I can’t find my school’ and it will let you register. For technical help please contact UCAS Progress directly on 0371 468 2 568. You will be invited in for an interview. If you are offered a Conditional Offer it must be accepted or declined by 23:59hrs Friday 22 March 2019 via UCAS Progress only. Am I in the catchment area? 1. Meeting the minimum academic entry requirements There are standard minimum grades needed to study A Levels, please download the entry requirements for more information. If you think you will not meet these grades you may wish to consider a BTEC Level 3. 2. Distance from the school to your home. Please read Criteria 4 of the Oversubscription criteria to determine where you fall in this category. 3. Availability on the courses you wish to study. We try to plan according to the data we receive from applicants to accommodate as many students as possible in the subjects they wish to study, but this is not always possible. Therefore a student who lives close to the school may not gain a place as the courses they choose are full, and yet a student who lives some distance away does gain a place as the subjects they choose have availability when they arrive for the enrolment interview in August. For entry in September 2016 the furthest male student came from 5.5 miles away and the furthest external female student came from 0.8 miles away. The route is by road not as the crow flies. For entry in September 2017 the furthest male student came from 4.9 miles away and the furthest external female student came from 0.9 miles away. The route is by road not as the crow flies. All Waldegrave girls who met the entry requirements and who wished to study in the Sixth form gained a place. This will change year on year depending on the applicants. We cannot guarantee a place. Advice and Guidance interviews will take place between November 2018 and March 2019. When will I find out if I have got a conditional place? All offers must be accepted or declined by 23:59hrs Friday 22 March 2019 via UCAS Progress only. If your application is declined that means that we are not able to offer you a place. In most cases this will be because your school reference indicates that you are not yet ready for A Level study. As well as sending a decline message through UCAS Progress we will usually inform your school and make suggestions as to your next steps. I've been given a Conditional Offer - does that mean I am guaranteed a place at Waldegrave Sixth Form? 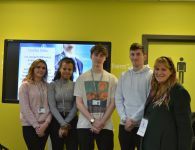 We cannot guarantee a student a place a Waldegrave Sixth Form until we know what grades they have achieved and if there is space on the course. You must always apply to at least 3 college or school sixth forms and hold those places open until you have completed Enrolment on GCSE Results day. What happens on Enrolment Day? Enrolment Day will take place on GCSE Results day – Thursday 22 August 2019. Applicants must collect an Enrolment Pack which contains important documents and the time to attend for their enrolment interview according to our Oversubscription Criteria. We strongly suggest that you attend your Enrolment interview in person with a parent or carer and do not book holidays over this period. Ofsted returns to Waldegrave after long absence! Staff and students at Waldegrave School are this week celebrating a report from Ofsted which has judged the school to be outstanding.